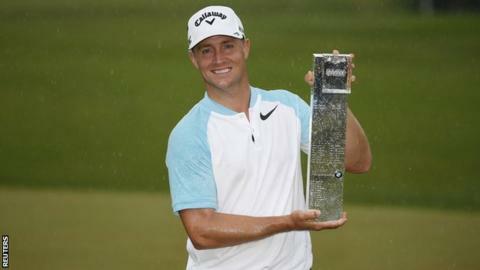 Sweden's Alex Noren was the perfect winner of last week's BMW PGA Championship at Wentworth. More than any other player, the 34-year-old from Sweden justifies the European Tour's claim that it is a viable alternative to the PGA Tour. This was Noren's fifth victory in the past 11 months and it has lifted him to number eight in the world. The overwhelming majority of the ranking points that have taken him to this elevated position have been earned on the European Tour. The likes of Spanish sensation John Rahm, British Olympic champion Justin Rose and US stars of the American schedule such as Rickie Fowler, Justin Thomas and Patrick Reed currently trail in his wake. And it is not as though Noren's resume is boosted by a massive influx of points from major championships. This is a player who has climbed into the top 10 solely off the back of success at standard tour events. His Wentworth triumph was the biggest title of a soaring career. It followed wins at last year's Scottish Open,European Masters,British Masters and Nedbank Challenge in South Africa. Noren is finally fulfilling his potential after missing most of 2014 with tendonitis in both wrists. "He's always been a hard worker, he works a lot on his game, sometimes maybe too much," Open champion and fellow Swede Henrik Stenson told BBC Sport. "He has been injured a couple of times over the years in his wrist and now I think he's found his formula. He's doing the same things week in, week out and it is obviously working. "He plays a pretty strong cut off the tee and his putting has just been phenomenal. I played with him when he won at the Nedbank in South Africa last year and the putts that he made were extraordinary." Fittingly someone so reliable wielding the short stick prevailed on the modified West Course last week. It has been remodelled to the tune of £5m and the greens could not have been better. The players had no excuses on the super-smooth putting surfaces, and Noren proved as much in his staggering final-round 62. And Wentworth was the other big winner from the event that launched the Tour's Rolex Series of elite tournaments. The layout is much fairer, yet it remains a demanding test. Noren was the only player to truly overcome it and that required a magnificent putting display. The West Course is once again a fitting venue for such a significant tournament. One area I would criticise, though, is the policy of growing rough around the bunkers. If the fairway lines were mown around the hazards they would play wider, there would be more scope for bump and run shots through shaved contours and it would be more aesthetically pleasing. With rough grown close to almost every green, chipping and pitching became rather one dimensional with players left with the sole option of taking an aerial route. More options equal more fun for player and spectator alike. Not that Noren is complaining. Rarely can he have had more enjoyment on a golf course and it is a win of potential significance going forward. "This tournament in my mind compares a lot with a major," he said. "What I wanted to do is play better against a better field and on better courses, tougher courses. "And I view this as a very difficult course against a very tough field." Noren's major record is modest to say the least, with his share of ninth place at the 2012 Open his only top-30 finish in any of the big four events that define careers. "It's just trying to improve my weaknesses and improve on my strengths, and trying to figure out where I'm losing shots, where I'm gaining shots," he added. "But overall, a win like this brings your confidence up, and that's what I've always needed, to believe in myself, and then it's easier to focus on what you need to do." Noren's compatriot Stenson, who triumphed at last year's Open at Royal Troon in sensational style, believes major success is within the compass of his fellow Swede. "It would be hard not to say that you can see a major for him in the future, if he keeps on playing like that," Stenson said. "He's played a bit more in America and I think that's a bit of a learning experience to take your game across the Atlantic and get familiar with the courses over there. He's making progress and he's had a very impressive year." Noren has played a handful of US events in 2017, finishing an encouraging 10th at the Players Championship earlier this month and reaching the quarter-finals of April's WGC Matchplay in Austin. But it is in Europe where he prospers. This week he plays the Nordea Masters - a tournament he has won twice and where England's Matt Fitzpatrick is defending champion fresh from a fine closing 66 at Wentworth. Attention then switches towards the US Open, where Noren has made just one cut in four previous events before the Stockholm man embarks on a run involving multiple title defences. Given the events of last week, he is more than entitled to approach it all with great confidence.